Honor Flight is a truly American phenomena grounded in a tradition of community values and good will. I’d like to pay tribute to some real heroes who did a great job of getting our WWII Veterans into the Memorial despite our legislators. Ironically, we had to protect the vets today from the many Congressmen and Senators who “just happened” to come by and try to get a picture out of it! There were so many of them that we had to form a line from Homeland Drive to the Pacific Arch to make sure the veterans could get into the Memorial. It was hard to keep a civil tongue! So to you heroes, THANKS AND THANKS AGAIN. To now Senator Jerry Moran from Kansas, I’d like to thank you for coming out again as you have so many times. To Bob Vogel and the staff of the National Park Service, thanks for making it all happen. Board members Jeff Miller and Dave Nichols were on the front lines all day. Jim Tayon of Missouri, Mary Pettinato of Chicago and John Doule of Heartland Honor Flight brought their vets into the Memorial for another grand celebration. It was a great day and hopefully Honor Flight is safe from the politics that are happening in DC at the moment. 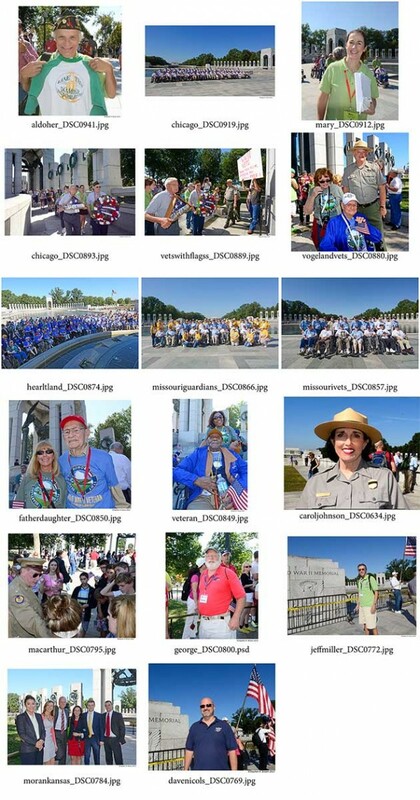 October 2, 2013 | Filed under Blogs, Books, DC Photo Book, Honor Flight, Photography, WWII Memorial and tagged with Arlington Cemetery, Current Affairs, DC PHOTO BOOK, Honor Flight, Jewel of the Mall, National Park, National Park Service, photography, Senator Robert Dole, Travel, veteran, Washington, World War II Memorial, WWII Memorial.